This post contains a comprehensive list of all countries in Africa having more than its fair share of a white population. Africa is home not only to the blacks but it also has a long history of keeping the whits within its neighborhood. 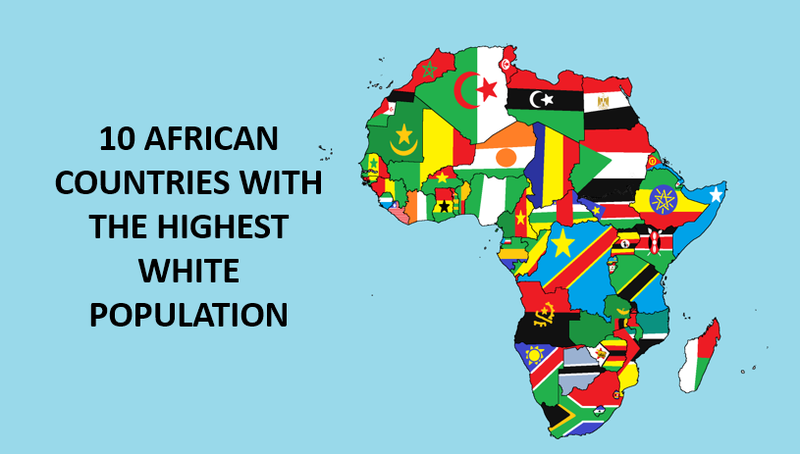 Bearing this in mind, here are the top countries in Africa with the highest white population. Senegal lies in West Africa and is surrounded by Mauritabia, Guniea, Guinea Bissau and the Gambia. It also shares a maritime border with Cape Verde. It is one of the top countries in Africa with the highest white population. its population of whites comprise more of French speaking Europeans, Vietnamese dwellers and Chinese immigrant traders. Botswana formerly a British protectorate also has one of the highest white population. Before independence, Botswana was dominated in politics by the white dwellers but today, not much of it is seen. With one of the highest white population, Botswana has notably descendants from the United Kingdom and the Netherlands. They form about 3% of the country’s population. Kenya has more of the English European population(numbering up to 32,000) than any other non-Africans. It is therefore has one of the highest white population. However, its share of the white population is only about 0.2% of its general population. Before its independence, Kenya was ruled by the British Empire . Today many of its white population consist of descendants from white settlers who came into the country at the colonial era. According to estimates, Mozambique is also one of the countries with highest white population. Many of such white inhabitants especially the Portuguese dominated the economy and politics in the country for nearly two centuries. According to estimates in 1975, the country had almost 350,000 Portuguese settlers but many of them migrated to South Africa and Brazil when the country gained independence in mid 1970s. Morrocco is predominately Islamic but has its fair share of Christians. However, it has a population of European dwellers numbering up to 100,000 which comprises of a greater mixture of the French and the Spanish. Nevertheless, after the country’s independence, many of this dwellers left the country leading to a subsequent decrease in its population of whites making the white community only about 0.3% of its total population. Tunisia is also one of the countries with the highest white population with many of these dwellers descendants of the Italians and French. It has the same amount of whites as Morocco but its number is at an increased percentage of 1%. The Island of Madasgacar surprisingly made the list of African countries with the highest white population. This dwellers came with the colonization of the Island and many of them never left. It has about 0.57% of its population as whiles many of the French who are of the Reunionese Creole origin. The Europeans in Namibia mainly came to this country as farmers of the Dutch origin escaping the British rule. The make the indigenous white Namibians, the Basters. They are about 8% of the countries general population. About 45% of the countries best ranching and agricultural lands are owned by this Namibians. Many of the white dwellers are of the English and German (Dutch) origin. Angola was once a Portuguese colony and therefore has many of its while population made of the Portuguese. Apart from the Portuguese, Angola has its fair share of Russians, Poles, Ukrainians and white Brazilians within the country. Many of them are descendants from the original dwellers and make about 1.2% of the total population. South Africa by far has the highest population of white people. Many of which settled after the first Dutch immigrants landed in the country on the shores of the Cape of Good Hope, which is today known as Cape Town. These early settles are the ancestors to the population of whites that today amount to about 8.7% of its total Population. Many of the white population that trailed the shores of Africa settled in and comprises of what is called today as the Afrikaans tribe. Many of these dwellers came to have a share of Africa and many of them stayed behind. And therefore, here are the countries in Africa the highest white population.